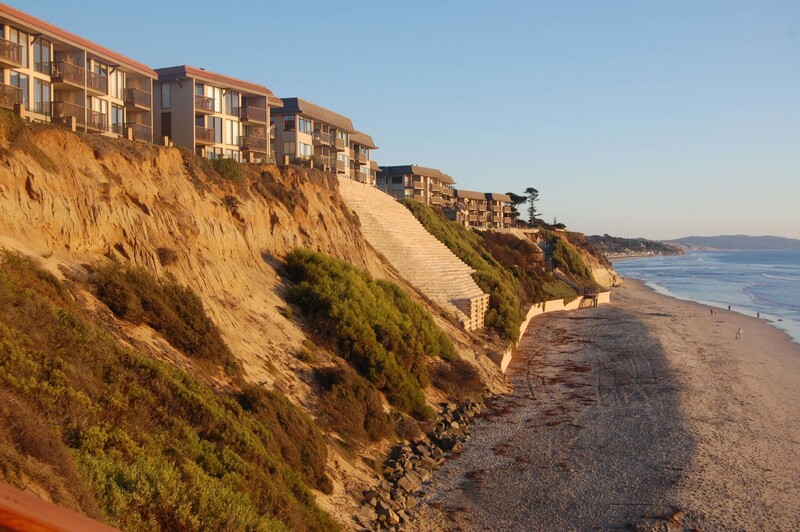 SOLANA BEACH — How much bluff-top property owners must pay to compensate the public for beach that is lost by seawalls they build to protect their homes could remain unknown for at least another year. A 12-month extension was triggered after council members at the Nov. 8 meeting voted unanimously to neither accept nor reject modifications recommended by the California Coastal Commission for the city’s local coastal program land use plan. In the meantime, the city will continue collecting $1,000 per linear foot, which it has done since 2008, and move forward with geographic segmentation, a plan that will allow the majority of residents to more easily gain approval for construction projects. The public recreation impact fee is a Coastal Commission requirement and part of the land use plan the city adopted in 2013 after more than a decade of work. An amendment setting the amount that should be paid was submitted to the state agency in April 2016. More than a year later, Coastal Commission staff recommended approval with 16 modifications. Solana Beach was amenable to all but a handful. The fee supported by the city was based on the physical footprint of the bluff retention device — basically length times width, consultant Leslea Meyerhoff said. Factoring in other data such as the estimated income of beachgoers, that equated to $431 per linear foot in 2016. The amount rose annually to $610 per linear foot by 2026. “The city’s recommendations were specific to local and unique conditions in Solana Beach,” Meyerhoff said. Coastal Commission staff proposed changing the estimated wages and the way the beach area is calculated to determine the size of the public area available for recreation, which doubled the impact fee, from $721 now to $1,192 in 2026. Attorney Arie Spangler, from The Jon Corn Law Firm that represents a group of bluff-top property owners, said Solana Beach should take time to find a compromise that works for its residents. “That’s just unfair and unreasonable,” Spangler said. “The Coastal Commission has no justifiable reason for the increase other than a desire to set a statewide precedent and force bluff-top homeowners to pay more money to protect their property. Bluff-top resident David Winkler agreed, saying he was concerned about the way the process was going. “They’re usurping your power,” he added. Chris Hamilton is chairman of the Beach and Bluff Conservancy, a group of property owners he said reluctantly filed lawsuits against the city based on previous Coastal Commission modifications to the land use plan. Hamilton said it is painful to see money being spent by the state, city and homeowners to fight the issues. “You guys have a perfectly good study to justify what you want to do or what we need to do here,” he said. Resident Jim Jaffee, who like Winkler, has been involved in the process since its inception, said the Coastal Commission recommendations are not arbitrary and should be adopted. He said virtually every seawall subject to the fees is on city-owned land. According to state calculations and based on the average size of seawalls in Solana Beach, property owners would pay double what the city was proposing — $42,100 rather than $21,550. The city said some of the modifications could undermine the validity of the entire fee study process partly because they didn’t reflect site-specific data and local beach conditions. A local coastal program, which regulates development in the coastal zone, is required by the California Coastal Act of 1976 to ensure coastal areas are used and developed according to statewide public objectives. Each local coastal program contains a land use plan, or ground rules for future development and protection of coastal resources. Solana Beach is unique in that the entire city, including the area east of Interstate 5, is considered the coastal zone. With geographic segmentation, the approximately 95 percent of residents who don’t live on the cliffs above the ocean will not require Coastal Commission approval when they want to alter their homes. “This has really held up the entire city,” Nichols said. “I don’t care for the whimsical treatment that we get from the Coastal Commission,” Councilwoman Judy Hegenauer added.